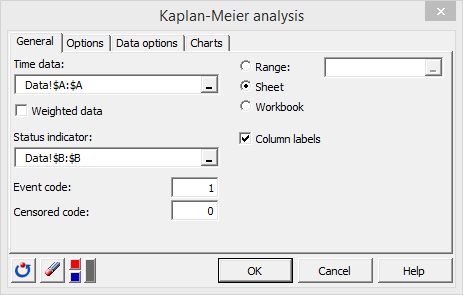 This tutorial will show you how to set up and interpret a Kaplan-Meier analysis in Excel including group comparison using the XLSTAT software. The data have been obtained in [Gehan E.A. (1965). A generalized Wilcoxon test for comparing arbitrarily singly-censored samples. Biometrika, 52, pp 203—223] and represent a randomized clinical trial investigating the effect of the drug 6-mercaptopurine on remission times (in weeks) of acute leukemia patients. Our goal is to determine if and how the drug influences the survival time, by comparing the survival curves for two groups of 21 patients, the first being treated, and the second being a control group. All 21 patients of the control group were observed to have a recurrence of their leukemia. Only 9 of the 6-MP patients had an observed recurrence time, while the 12 others were censored. 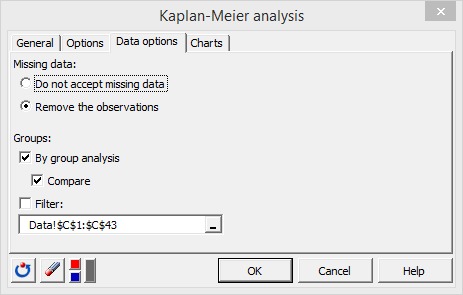 After opening XLSTAT, select the XLSTAT / Survival analysis / Kaplan-Meier analysis command. 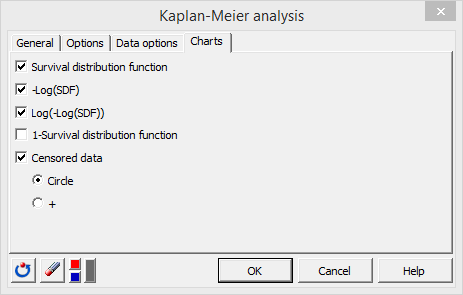 Once you've clicked on the button, the Kaplan-Meier analysis box will appear. Select the data on the Excel sheet. The Time data corresponds to the durations when the patients either relapsed or were censored. The Status indicator describes whether a patient relapsed (event code=1) or was censored (censored code = 0) at a given time. In the Data options tab, activate the By group analysis and select the group information in the data field. Thus XLSTAT will take into account the information whether the patient belongs to the control or the treated group. Activate the Compare option so that the comparison tests are computed. The Filter option allows you to select precisely the groups on which you wish to perform the analysis. In the Charts tab, activate the charts you wish to display, and choose the symbol you want to use to represent Censored data. The computations begin once you have clicked on OK. The results will then be displayed on a new Excel sheet. Then XLSTAT displays results specific to each group. It starts with the Control group. First, the Kaplan-Meier table is displayed. It contains the results of the Kaplan-Meier analysis with several key indicators such as the Survival distribution function. 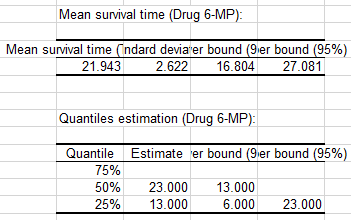 The next tables give the mean and median survival time and the respective confidence intervals. 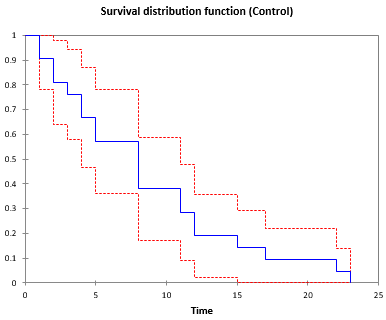 Then, we can visualize several curves, including the survival distribution function (SDF, or survivor function, or reliability function), bounded by the confidence intervals. 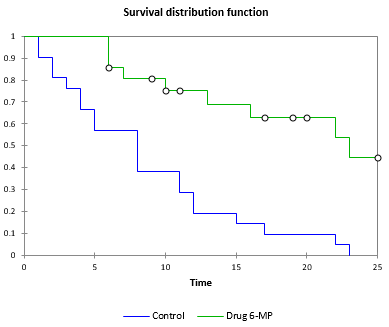 Next, the same series of results is displayed for the Drug 6-MP group. The following results contain some values that are missing because they could not be computed. 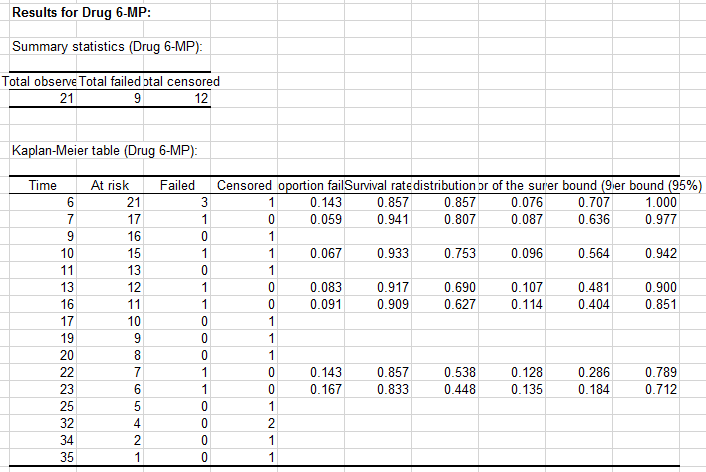 We notice that the median survival time is a lot lower for the control group than for the 6-MP group (8.667 vs 21.943). In the SDF, circles identify the censored data. Then, we can compare the two groups. First, a series of tests is displayed in a table (Log-rank, Wilcoxon, Tarone-Ware). 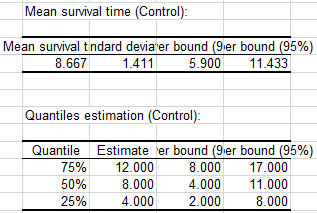 From the results we can see that the difference between the two survivor functions is very significant. 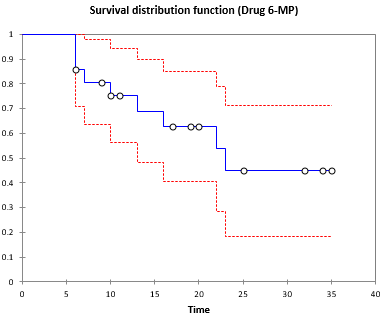 Last, the comparison of the two survival curves allows us to conclude to confirm that the drug significantly improves survival time of patients.